Though easy to miss while driving along Whitmarsh Road in Ostego County, the Sturgeon River Preserve is a gem and an enjoyable spot to soak in nature. The heart of the preserve is its namesake river which contains 2,100 feet of frontage along the Sturgeon River, a Blue Ribbon trout stream that flows through the northern half of the property. Access to the tract is a pair of short trail loops and a 380-foot-long boardwalk along the river. Though easy to miss while driving along Whitmarsh Road in Ostego County, the Sturgeon River Preserve is a gem and an enjoyable spot to soak in nature for anybody who takes the time to stop. The 40-acre preserve was donated to the HeadWaters Land Conservancy in 2011 and opened to the public two years later. 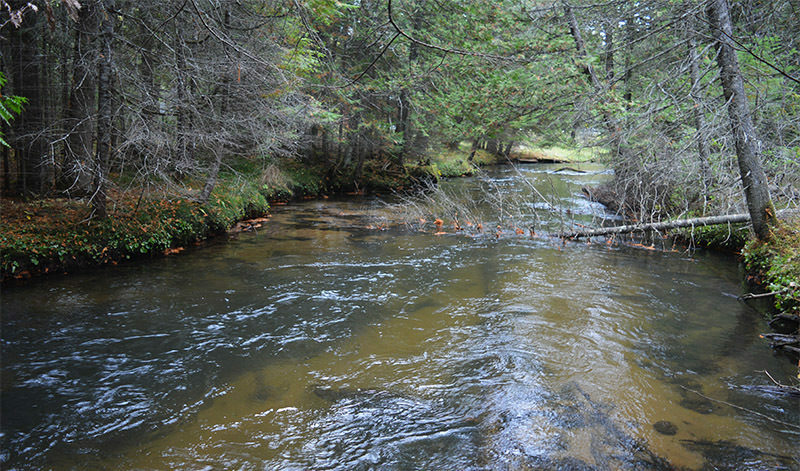 The heart of the preserve is its namesake river which contains 2,100 feet of frontage along the Sturgeon River, a Blue Ribbon trout stream that flows through the northern half of the property. The terrain varies from cedar swamps and clearings of towering bracken ferns to ridges and hills forested in birch, hardwoods and some impressive pines. The preserve has been dedicated to the late Calvin “Rusty” Gates Jr., owner of Gates AuSable Lodge, founder of Anglers of the AuSable and a conservancy board member who died in 2009. Gates is most often associated with the Holy Waters of AuSable River but he often fished the Sturgeon River. A sign at the entrance of the preserve pays tribute to Gates with two carved, hand-painted trout flies flanking his name. The HeadWaters Land Conservancy has built a pair of short trail loops and a 380-foot-long boardwalk along the Sturgeon River that is slated to be finished in 2019. 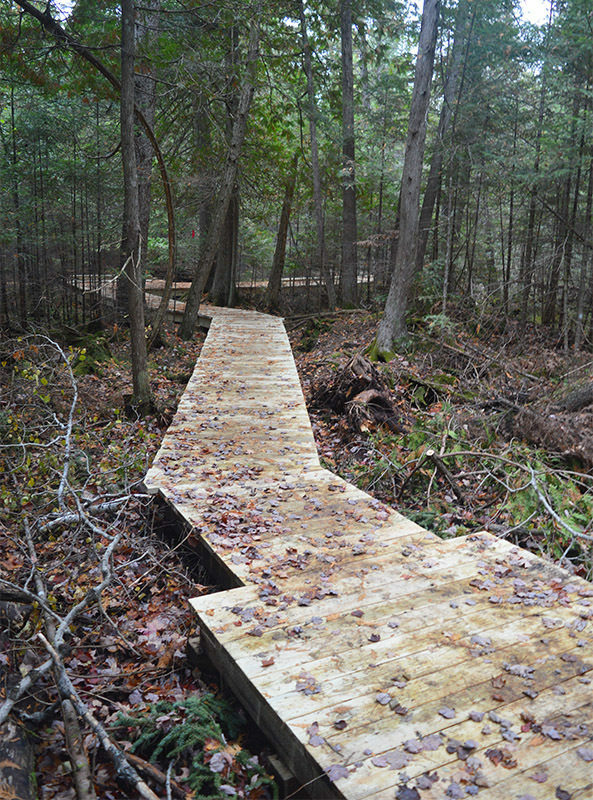 All together the trails and boardwalk can be combined for a 0.8-mile. The size of the preserve makes it best suited for hiking, snowshoeing, birding, tree and plant identification. 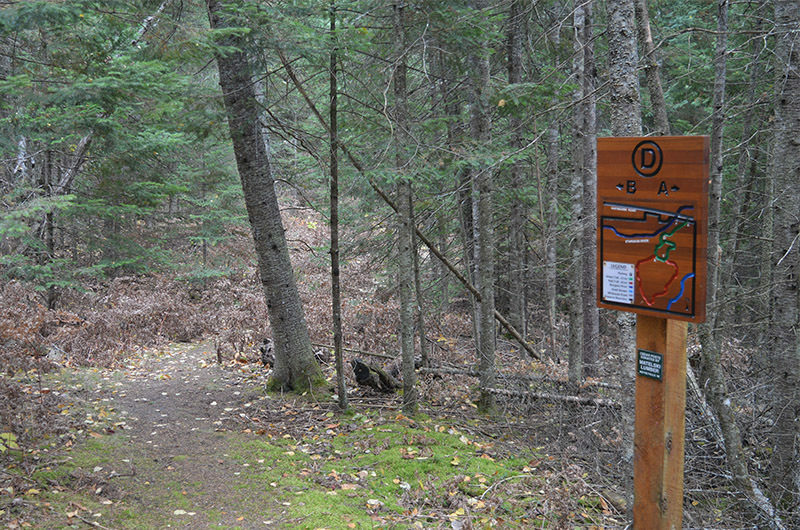 The most scenic and interesting segment of the trail system is the beginning of the Green Trail that departs the Whitmarsh Road trailhead and clings to a low ridge above the Sturgeon River. Gurgling below through a cedar swamp is the trout stream, 20 to 30 feet wide at this point. Within 200 yards you descend to the south end of the boardwalk that skirts the river as it loops back to the trailhead. The Green Trail climbs back up the ridge to quickly arrive at post D. Continue south (right) to reach post B at Mile 0.17, the start of the Red Trail. The Red Trail stays on the ridge briefly but out of view of the Sturgeon before it swings away all together. It becomes a level walk at this point that passes some impressive pines less a third of a mile from the trailhead. 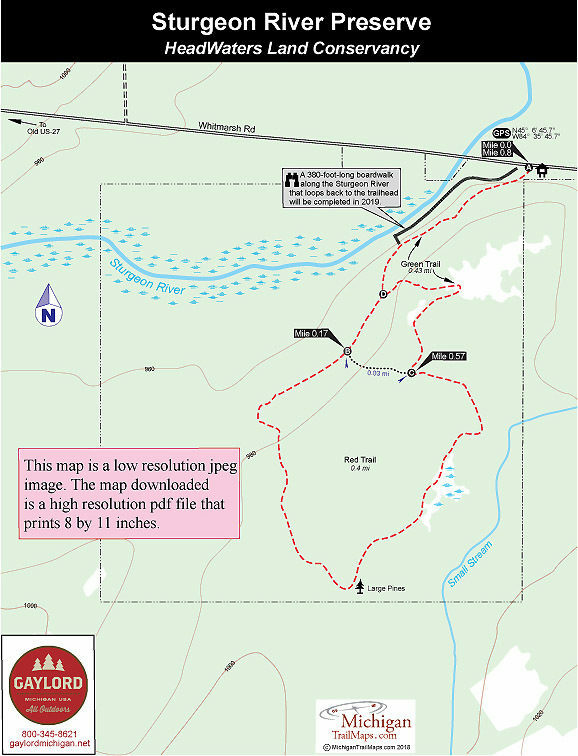 At Mile 0.57 you reach post C and within a couple hundred yards return to post D. Backtrack to return to the trailhead or follow the boardwalk. Other than parking there are no facilities at the Whitmarsh Road Trailhead. 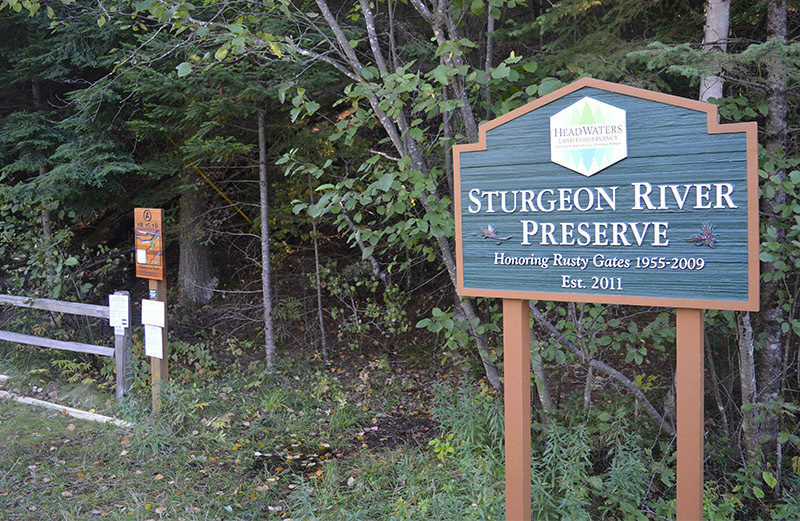 There are no entry fees at Sturgeon River Preserve. From Gaylord, travel north on Old 27 for 6 miles. Turn right (east) on Whitmarsh Rd. and continue for 3 miles. The trailhead is just past the intersection of Whitmarsh Rd. and the Sturgeon River. Contact the HeadWaters Conservancy office (989-731-0573) in Gaylord for more information. For travel information contact the the Gaylord Area Tourism Bureau (800-345-8621; www.gaylordmichigan.net).